The card that makes the deck work is Mithrandir's Advice. So I included Heed the Dream to get it more consistently. What a great idea for a deck! Really enjoyed playing it. Really nice deck, I've tried it and it works really good ! I'm waiting for the release of Mount Gundabad to try this with a little modification. 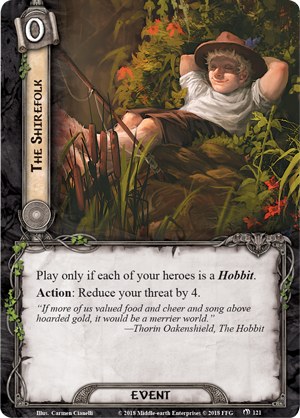 I'm pretending to switch Mirlonde for Bilbo Baggins and play it as a monolore-hobbits deck, which will allow me to play Hobbit-sense and The shirefolk. Not sure if it will work as good as your original deck, but I think it is worth to try it. Anyway, very good job with this deck ! Thank you! I'm glad you liked the deck! With Mount Gundabad we will get Drinking Song which is much better than Heed the Dream. I was thinking about Bilbo Baggins but I am not sure it will work here because we dont often play Sword-thain on a Hobbit ally. And in that case we won't be able to play The Shirefolk.